The main character in the story, Emaline, is such a headstrong young lady. (I love that Dessen always writes such strong heroines.) Emaline has so many decisions to make about her life now that she has graduated high school. Yes, her life is an emotional mess of confusion, and it only gets worse as the book goes along. But Emaline is surrounded by an amazing support system, and keeps a level head even through the worst. These types of characters make me proud; these are the characters that I love the most. The love interest in the story is between Luke, Emaline’s high school sweetheart, and Theo, who has come to the island for the summer to work on a documentary. I don’t think that I would consider the relationships between Emaline and these boys as a love triangle. It was so much different than that. I liked Luke from the beginning, even though he made a few bad choices. Theo, on the other hand… Well, I liked him at first, but it just went downhill the more I read about him. Each boy had a different purpose in Emaline’s life. I feel that they both showed her how different life could be for her. In the end, I was really satisfied with the choice that she made for herself. The relationship that Emaline has with her family is really heart-warming. Not only does she have a wonderful bond with her mother, but also with her dad, who is actually her adoptive dad and her step-sisters, who are so much more than that. I love that she was surrounded by so much love in her family. I also really loved her new found relationship with her half brother. He was super sweet. The ending of the story took a completely different direction than I expected it to, and I loved Dessen all the more for it. I absolutely love the ending. It’s an ending that I am proud to have my teenage daughter read. You are definitely going to have to read the book to find out exactly what happens. The storyline is a great story that I think should be a recommended read for all teenage girls. 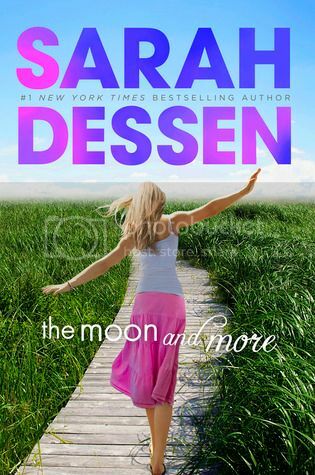 It was a really great read, as all Dessen’s books are. Overall, I really enjoyed this book! It would make a great summer/beach read. Of course, if you already love Sarah Dessen, you will definitely enjoy this book. Check it out! I do love a good Sarah Dessen. They're always great beach reads, they're sweet love stories and fun. I like that this one is set on an island and that Emaline is just out of high school. I try to portion out my reading of Dessen books! If I read too many at once, I end up underwhelmed with each successive book and I don't want that to happen with THE MOON AND MORE. The way you describe it makes me hopeful that I'll really like it though! I liked Theo at first too but it quickly went downhill as he seemed to reveal more of his true character. This wasn't one of my favorite Dessen's unfortunately. Hopefully I'll like her next one more.